TL;DR - Arcus provides a set of open-source components that make it easier to build applications that run on Microsoft Azure. Over the past couple of years, Codit has had more and more customers that started building applications that run on Microsoft Azure. During those projects, we have identified components that we had to implement over and over to build a boilerplate for our applications. We are happy to announce Arcus, our open-source family of libraries and components that makes it easier to build applications for Microsoft Azure. Our goal with Arcus is to fill the gaps that we experience, but don't want to reinvent the wheel. If there is already a component or library that does the job we prefer to support that community. Today, I will show you what we have done up until today and where we are going. Let's have a quick look at how easily we can push events. For the sake of this post the NewCarRegistered class is not included but you can have a look on GitHub and our docs how to do achieve this. Next we will create an Event Grid Publisher and publish events to the topic. In this example, we only push one event, but we also support sending batches via PublishMany. 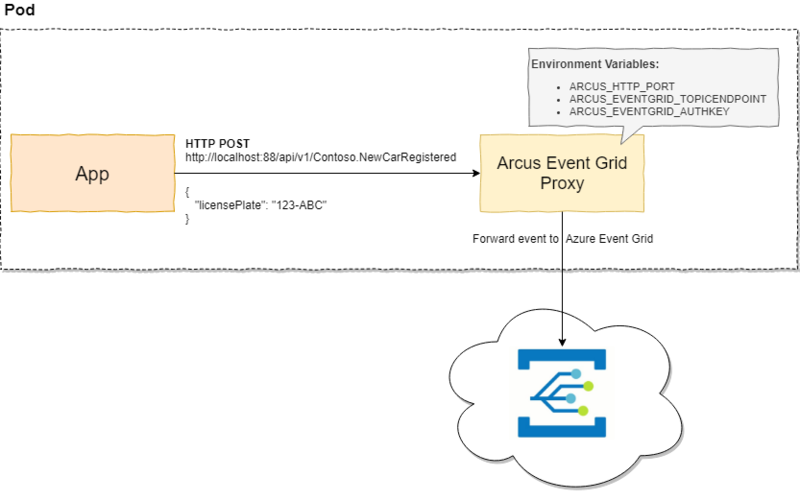 Integrating with Azure Event Grid is simple and, hopefully, Arcus Event Grid makes it even easier for you to do so! However, in some cases, this is still overkill because we need to write custom code to push schemas while that code still needs to run somewhere. It would be easier if we could just push events via HTTP, without having to worry what the endpoint is & how to authenticate! This is exactly what Arcus Event Grid Proxy does! It is a simple Docker container which accepts HTTP requests and will forward it to the configured Azure Event Grid topic. By using a Docker container, you can basically deploy it wherever you want - Be it on Service Fabric Mesh, as a side-car in Kubernetes, on-premises or simply on your laptop for local testing! Sending events is just as simple as doing an HTTP POST to it with the event payload, or provide more context about the event. The beauty is that it does not only allow you to get started very easily, it also allows you to send events to Azure Event Grid that don't support it yet without having to implement & run your own code on Azure to achieve this. Different use-cases require different image tags, that's why we provide three flavors of them. We strongly recommend reading more about our tagging strategy and only use arcusazure/azure-event-grid-proxy:latest for POCs. Security is one of thé most important aspect when building applications, this is no different on Microsoft Azure! As of today we only support Azure Key Vault, but we might add more providers later on. Our aim was to make it super easy and provide seamless authentication by doing the Azure AD integration for you. We have a couple of authentication schemes that are currently supported, but more will follow such as certificate authentication. This will be stored in an in-memory cache to not leak the secrets and is configurable to fit your needs. While we already have some components covered, this is just the beginning! We are open to suggestions and are happy to accept pull requests!